Lovely Maisonettes Very Close To The Virgin Beach ! 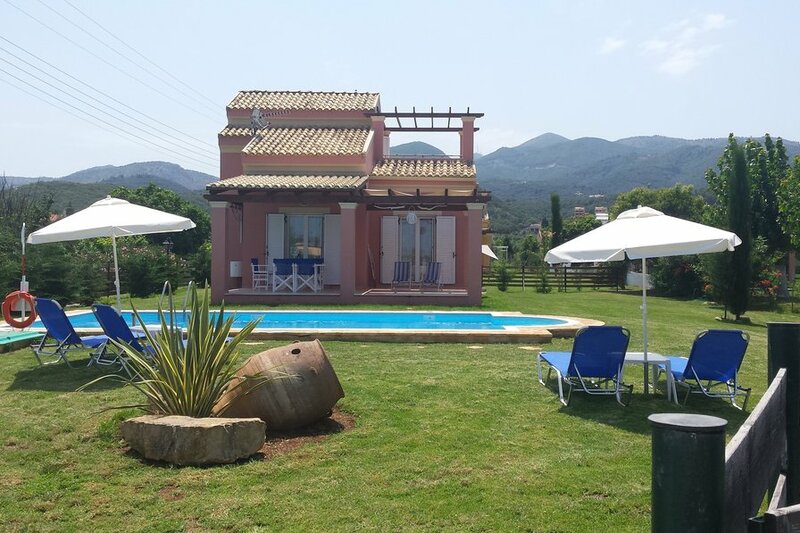 Our property is a group of 5 independent maisonettes- 2 of them have a private pool- in a green land plot 5.000 sq meters, set within the peaceful area of Almiros, 120 meters from the virgin beach. Each maisonette is 60 sq.m, fully furnished and it consists of a seating room, a fully equipped kitchen, a master twin bedroom and a bathroom/ WC on the ground floor, and a twin bedroom and A VERANDA WITH VIEW TO THE SEA on the first floor. Including a sofa bed in the siting area each maisonette has a maximum capacity of 5 people. Two of the maisonettes have a private pool. All of them are set in a green private land plot of 1.000 sq. meters. Our villa is on a distance of less than 2 km from the busy resort of Acharavi and the water park "Hydropolis". SEND OWNER YOUR REQUEST WITH THE NUMBER AND TYPE OF MAISONETTES YOU WISH AND GET THE ACTUAL PRICE. Almiros, one of the most beautiful and virgin areas of Corfu, is situated on the north part of Corfu near the resort of Acharavi, at the foot of mount Pantokratoras (914 m.) and just opposite the Albanian mountain range. Almiros Beach, is almost 2 km. long and is extended from Acharavi to the picturesque lake “Antinioti”. The beach has obtained the European Blue Flag. It is a long, beautiful sandy beach, with clear water and unspoiled scenery which remains as it was years ago. Nearby Almiros, there are many beautiful and peaceful bays for people who like swimming on small bays, away from noisy and crowded beaches. Almiros is no way a 'resort' as there are just six Tavernas servicing good quality food in good prices with very friendly manners, one mini-market, a small number of scattered villas and apartments for rent as well as permanent residences, with colorful gardens and beautiful yards. The nearest resort Acharavi is a busy and lively resort set on the North coast of Corfu, boasting something for everyone. It is not just a family resort, it is the center of the North of the island and many of the local people visit Acharavi on a regular basis as there is a post office, banks, a dentist and doctors and all the facilities found in a modern place. Acharavi has plenty of Tavernas and bars, and an excellent, long, sandy beach. Behind the resort and Sfakera village, in the Pantokrator mountain are set in the hills excellent walking paths. There are also several picturesque mountain villages including Petaleia, Ano Peritheia and Lafki. At the western edge of the municipality is the Antinioti Lagoon. Little streets run off the road down to the beach, where you will find many of the beach Tavernas and bars.